Coll. No. 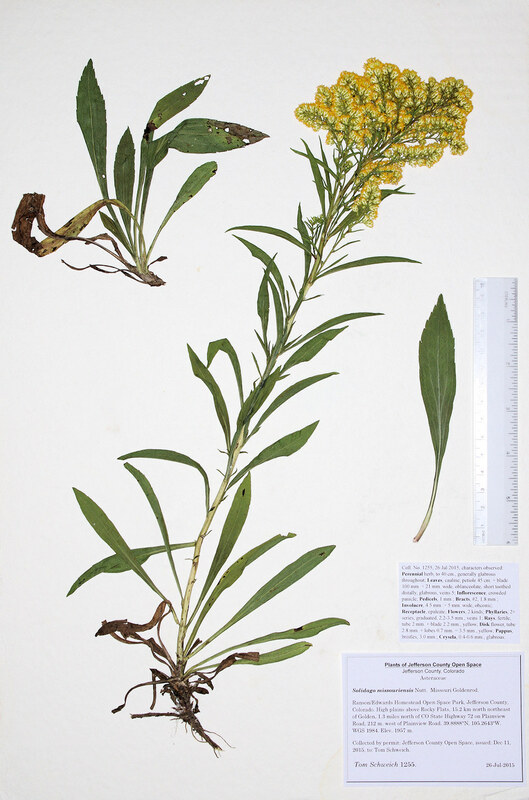 1255, 26 Jul 2015, characters observed: Perennial herb, to 40 cm., generally glabrous throughout; Leaves, cauline, petiole 45 cm. + blade 100 mm. × 21 mm. wide, oblanceolate, short toothed distally, glabrous, veins 5; Inflorescence, crowded panicle; Pedicels, 1 mm. ; Bracts, #2, 1.8 mm. ; Involucre, 4.5 mm. × 5 mm. wide, obconic; Receptacle, epaleate; Flowers, 2 kinds; Phyllaries, 2+ series, graduated, 2.2-3.5 mm., veins 1; Rays, fertile, tube 2 mm. + blade 2.2 mm., yellow; Disk flower, tube 2.8 mm. + lobes 0.7 mm. = 3.5 mm., yellow; Pappus, bristles, 3.0 mm. ; cypsela, 0.4-0.6 mm., glabrous. Field Notes: Coll. No. 1255, 26 Jul 2015.